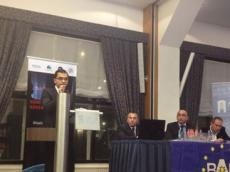 Azerbaijani Diaspora on the eve of Human Rights Day has hosted an event on Khojaly massacre in the Hague. According to the Azerbaijani Students and Alumni International Forum (ASAIF), the event has brought together MPs Ganira Pashayeva, Adil Aliyev, head of the Union of Turkish and Azerbaijani Women in the World Tanzila Rustamkhanli, Chairman of the Coordination Council of the Azerbaijan Community of Nagorno-Karabakh Orkhan Akbarov and coordinator of ASAIF for Belgium and Holland Musa Hasanov. Addressing the meeting, the head of the Coordination Council of the Azerbaijani Community of Nagorno-Karabakh Orkhan Akbarov briefed the participants on the progress achieved on recognition of the Khojaly massacre in the world, adding the discussions on this occasion would be held in the parliaments of the different countries. Musa Hasanov provided information on Khojaly genocide adding that in 1993, the UN Security Council in four resolutions unambiguously reaffirmed the sovereignty, territorial integrity and inviolability of borders of Azerbaijan and claimed to immediately and unconditionally withdraw the armed forces of Armenia from Azerbaijan`s occupied territories. He also said that Armenia refuses to honor UN Security Council`s four resolutions.